TORONTO — The Toronto Wolfpack, hoping to further grow rugby league, are looking at playing a game in Serbia next season. The transatlantic team, which missed out on promotion to England's Super League in a 4-2 loss to London Broncos in the so-called "Million Pound Game" on Oct. 7, will open its third season Feb. 3 at the newly promoted York City Knights in the second-tier Betfred Championship. The schedule, which still seems somewhat under construction, features just nine of 27 regular-season games in Toronto. The Wolfpack, under new coach Brian McDermott, will play their first 11 — and perhaps 12 — games on the road. The first outing at Toronto's Lamport Stadium will be either April 27 against Swinton Lions or May 4 against Bradford Bulls. The club says the April 27 date could take place in the United Kingdom. The Bradford game will be followed by eight home and six away games. Eight of the Wolfpack's final 11 games are at home, with the regular season wrapping up Sept. 7 against the visiting Leigh Centurions. Four other designated home games will or could take place on the other side of the Atlantic. The Wolfpack meet the newly relegated Widnes Vikings in Newcastle on Feb. 17. A March 17 home game against Batley Bulldogs will be played at an English venue yet to be announced. Toronto will face France's Toulouse Olympique in Blackpool, England, on May 18 as part of the Betfred Championship's Summer Bash weekend. The club says it hopes to take the April 7 matchup with Sheffield Eagles to Serbia with Belgrade reportedly the site. The Red Star Belgrade Rugby League Club is taking part in the Challenge Cup in 2019 and hopes to join League 1 status in 2020. The Wolfpack have also looked at playing in Dublin, Barcelona and Rotterdam. Toronto home games will likely kick off at 1 p.m. next season rather than 4:30 p.m. The Championship has grown to 14 teams with the addition of promoted York City and Bradford. Toronto is gearing up for its third season having won promotion out of second-tier League 1 in its inaugural 2017 season and coming within a whisker of promotion in 2018 after topping the Betfred Championship but falling just short in the promotion playoffs. The Wolfpack parted ways with coach Paul Rowley in the off-season. He had led the team to a glittering 53-7-3 record in its first two seasons. He was replaced by McDermott, a 48-year-old former royal marine who was fired by Leeds Rhinos in July during a disappointing, injury-plagued season. In eight seasons at Leeds, McDermott won four Grand Finals, two Challenge Cups, a League Leaders' Shield and a World Club Challenge. Other new faces at the Wolfpack this season include Samoan international centre Ricky Leutele and veteran England forward Jon Wilkin. Also joining the team are Warrington Wolves second-rower Bodene Thompson, Castleford Tigers prop Gadwin Springer and Widnes scrum half Joe Mellor and second-rower Tom Olbison. Forwards Cory Paterson and Richard Whiting have retired. Jack Bussey moved to Featherstone. Under the new promotion format, the top five Championship teams will meet in the playoffs to determine which teams moves up to Super League. The bottom Super League team will be relegated. The bottom two teams after the Championship regular season will be relegated to League 1. The League 1 champion wins automatic promotion, with a playoff to decide the team that joins them. 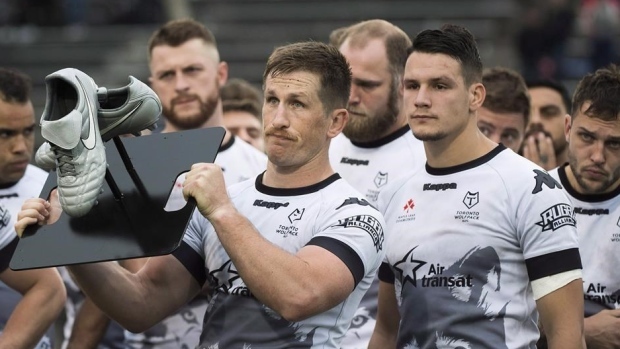 The Rugby Football League says Toronto and Toulouse will not take part in the new 1895 Cup, a knockout competition for non-Super League teams. A Toronto spokesman said the Wolfpack will not take part for logistical reasons, given the new cup competition will primarily be played midweek. 18: vs. Toulouse Olympique, Summer Bash at Blackpool, England.